KUWAIT CITY, June 6: Living up to their billing as one of the most likely title contenders, the juggernaut lineup of Al Qwassem All Stars proved their worth once again as they grabbed the tournament leadership after overpowering erstwhile front runner NLB Corporation in their fifth week match at the on-going elimination round of the 2018 Season 13 FTBK Tenpin Bowling Team Tournament. Not to be discounted was the sterling performance that Clash of Strikes dished out in brushing aside the K2E2 Thunders which also earned them the team of the week award. 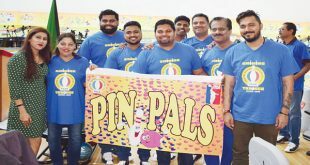 Overwhelming their respective rivals on their way to equally impressive display of pin busting were World Class, Cozmo Salmiya, DMDA Bowleros, Indian Bowling League (IBL) and D’ Islanders. 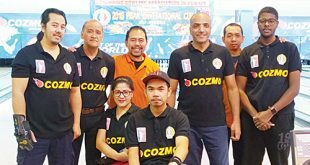 Hoping to improve their Season 12 first runner up finish in this event organized by the Filipino Tenpin Bowlers Kuwait (FTBK), Al Qwassem All Stars might be headed in that direction as they emerged as the new pace setter after posting a 3,195-3032 win over deposed leader NLB Corporation. In the opening of this 4-game series match, the pump masters of NLB took the early initiative by eking out a 785-745 victory. Al Qwassem then came back in game two with a masterful 810-714 win that handed them the lead after two games 1,555-1,499. On the next game, NLB sliced down the lead of Al Wassem to just 11 pin falls through a hard earned 808-763 victory. With Mousa Abdullah, Hanadi Mezaiel, Naveen Waseel and Farid Gabriel taking care of the scoring load, Al Qwassem All Stars went on to win the match by subduing their rival in game four 852-725. Bowling for NLB Corporation in this outing were Chris Bulacja, Nelson de Leon, Rudy Zablan, Philip Marimla, Adnan Mousa and Chit Mariano. 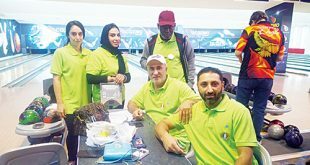 With their 2-handed bowlers hampered by the oiling pattern Clash of Strikes suffered string of setbacks early in the tournament and found themselves lingering at the bottom of the team standings. But after halting their 3-game losing streak with a victory in the fourth round, the slow starting keglers of Clash of Strikes are on their way to recovery after posting their second straight win at the expense of the K2E2 Thunders whom they brushed aside in their scheduled week 5 encounter via a 3321-2998 rout. Slowly but surely coming to terms with the lane condition, Clash of Strikes quickly grabbed the lead with an 820-779 win in game one that was followed by another easy 790-668 victory on the next game. With their backs against the wall, the K2E2 Thunders through the combined efforts of by Edwin Latoja, Jess Farne, Mike Gonzales and Joan Latoja snatched an 801-740 decision in the penultimate game of the match. Still comfortably ahead 2,350-2,268 at the end of game three, Clash of Strikes with the foursome of Mahmoud Dashti, Hassan Karam, Yoon Ji Han and Kukyoung Nam in the roster closed out their stint with a superb 946-730 win in the final game of the match. Meanwhile, the World Class lane masters followed up their tenacious fourth round performance with another equally impressive 3,153-2,932 total pin falls victory over Rock N Bowl. With Lee Mills and Jason Baker at the helm of the scoring chores, World Class outclass Rock N Bowl in the first two games of the match 841-784 and 806-644. Down but not out, the Rock N Bowl quartet of Liza Catapia, Rod Llait, Pilar Patula and Sami Behbehani their counterpart in game three 806-714. In the last game of the match, World Class once more stamped their class over Rock N Bowl 764-698. 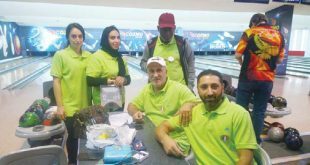 Cozmo Salmiya another team trying to recover from a bad start also made a notable headway as the entertainment specialists walloped defending champion Lane Surferzz 3,124-2,843. After Cozmo posted a modest 745-661 win on the first game, the Lane Surferzz were able to hold Cozmo to a 793-793 draw in game two. As the Lane Surferzz continued to squander their chances, Cozmo Salmiya led by Ronnel Valencia, Jacky Guitang, Bernabe Alfaro, Paul Arcayan, Lee and Cris Batucan went on to win the next two games via 816-696 and 746-694 scores. 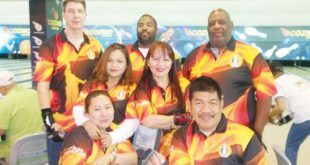 In the other completed matches of the fifth round, the architectural designers of DMDA Bowleros vanquished the Original Pin Killers in all four games of the match in booking a 3,094-2,585 total pin falls victory. Headed by Jun Guerra, Sonny mariano, Tito Tamayo, Alfred Avila and Al Belarmino DMDA defeated the Pin Killers in four straight games 813-661, 803-688, 730-646 and 723-590. 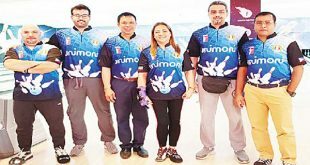 The Indian Bowling League pin busters on the other hand headed by Rani Skeik, Ahmad Sultan, Rudolph Castellino, Fatima Sequeira, Nikshita Shetty and Uly Menezes banked on their victories in games one, two and four to beat Siete Pares 3,063-2,916. Faie Reyel, Rico galang, Manny Nazaire and Jazel Pangilinan bowled for Siete Pares in eking out their 754-694 win in game three. In the only other pairing of the round, D’ Islanders led by Janet Shaikh, Rolly David, Edgar Pascua, Vernie Villaruel, Danny Doctor and Bobby Carambas rebounded from an opening game loss in subduing Strikers X 3,042-2,855. Mad Investment LLC who bowled all alone garnered a total score of 3,140 pin falls. For the Individual and Team High scores the current record holders are as follows: Individual High Game Men Group 1: Glenn Corbit — 248, Men Group 2: Mohammad 236, Ladies: Janet Shaikh — 234; High Average Men Group 1: Glenn Corbit — 188, Men Group 2: Hassan Qassem — 175, Ladies: Jheng Liwayway — 181; Team High Game: NLB Corporation — 797 and Team High Series-Rock N Bowl — 3,197. The team standings after the fifth week are as follows (read as rank, team name and total score); 1. Al Qwassem All Stars — 15,499, 2. NLB Corporation – 15,407, 3. World Class — 153,12 4. Rock N Bowl — 15,297, 5. D’ Islanders — 15,217, 6. MaD Investment LLC — 15,214, 7. DMDA Bowleros — 15,168, 8. K2E2 Thunders — 15,127, 9. Indian Bowling League — 15,079, 10. Lane Surferzz — 15,027, 11. Strikers X — 14,929, 12. Clash of Strikes — 14,799, 13. Siete Pares — 14,749, 14. Original Pin Killers — 13,966, 15. Cozmo Salmiya — 13,929.